On Tuesday, November 7th, I went with my mom and my sister to Fairmont, WV to spend time with my nephew! Ryan is a Freshman at Fairmont State University, and thanks to early voting, we were able to take Tuesday to drive up there, take him out to lunch between classes, and get a peek at his dorm. We also met a few of his fraternity brothers, who I was surprised to find were a very nice, polite group of young men....despite the fact that they apparently like dressing up as bananas and roaming the downtown district in their spare time, lol. A shout out for the wonderful restaurant we ate at: Muriale's in Fairmont was an awesome Italian place with great service and great food. If you take advantage of the lunch specials, it's especially affordable. Anyway, as usual, I had to consult my own blog to see if there were any good ghost stories to explore while on campus. For some strange reason, despite the town of Fairmont being a pretty historical place, there aren't really any ghost stories of any substance that I found. 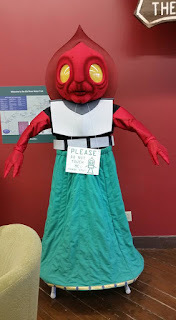 I thought for sure the campus would be filled with the typical college urban legends, but nope. NADA. So, if you know of any Fairmont ghost stories or haunted buildings around the city, please please please comment below or send 'em to me at theresarhps@yahoo.com ! 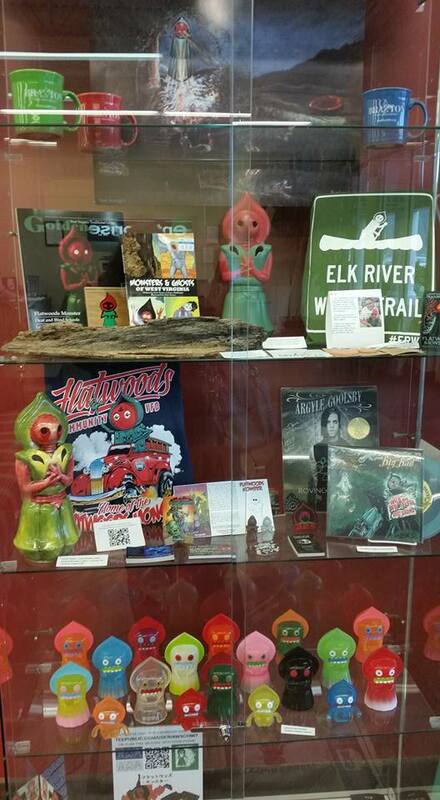 The trip wasn't a complete bust, though, paranormally speaking. Since we had to go through Flatwoods to return home to Putnam County, we decided to stop. My sister wanted to look around the Fiesta Outlet, and I saw a discount bookstore in the same shopping center. While I was walking over to the bookstore, I passed the Braxton County CVB office. I had heard about the display, and wasn't disappointed! 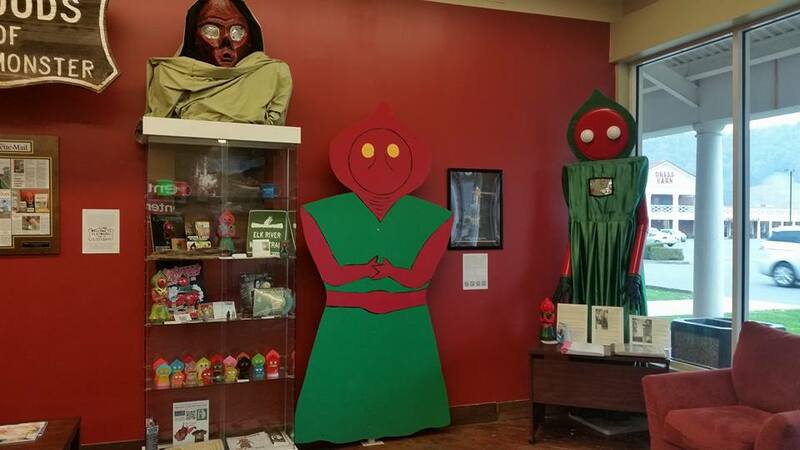 One little area of the office was completely devoted to the Braxton County/Flatwoods Monster, complete with models, memorabilia, and two notebooks filled with documents and articles about the 1952 sighting. There are a ton of great resources out there to consult for more information on the Braxton County Monster, but in short: In September of 1952, a group of kids playing football witnessed what appeared to be some sort of aircraft fly overhead and crash on a nearby mountain. They rushed to the home of one of the boys, where his mother and a neighbor accompanied the group up a mountain road to look for the crash site. What they found was a strange and creepy THING, that was later theorized to have been some sort of being in a spacesuit or smaller craft. 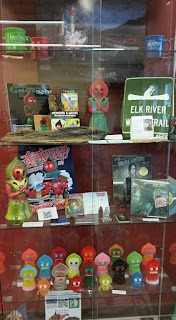 Seeing the display and knowing that over the past few years the city has really embraced its monster heritage was pretty awesome. However, we weren't done. 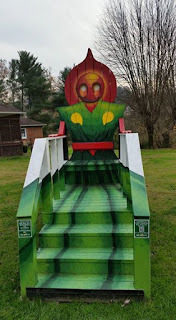 The county also maintains five Monster Chairs in various locations throughout the area. While we were apparently quite close to two of the five, we went a tad out of our way to the Gassaway Dairy Queen and visited the first chair to be installed.